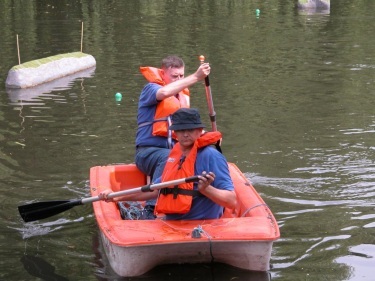 Our home lake is in Wardown Park, Luton. Luton Council allow the Club access at anytime providing there are two or more club members present. The Council also provide us storage facilities for such things as tables, the floating harbour, navigation bouys, generator etc. We also have access to our own private toilet. Sailing all year round is usually on Sunday mornings from about 10am and also on a Tuesday or Thursday mornings according to arrangements made in advance between members wishing to sail mid-week. No internal combustion boats are allowed due to the wildlife with which we share the lake. Electric, steam and wind powered boats however are able to sail without restriction. Visitors are welcomed anytime that club members are present, and are encouraged to bring along a boat and sail so long as they introduce themselves first. Due to Council regulations and insurance restrictions no sailing is allowed by any member of the public unless club members are present. We do hold a number of 'Open Days' during the summer season. 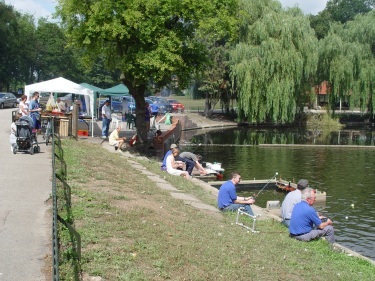 The 'Open Days' themselves tend to be lighthearted and are usually combined with 'public open days' where we encourage the public to participate in our hobby. These events normally include a club barbecue. We also have a number of 'Evening Sail' events during the year when those members with boats equipped with lights have the opportunity to enjoy the atmosphere to the full. A Winter view of the lake. Our Rescue Boat, 'Puddle Jumper'. The floating harbour, built by John Morgan. George Izzard's PT15 Torpedo Boat.